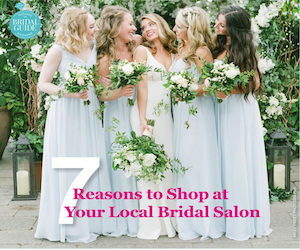 It was eye-opening to read through hundreds of online reviews that brides have written about their experiences dress shopping at salons nationwide in preparation for this issue. Even though I know better, I found myself getting emotionally wrapped up in their stories. More than once, anger flared up over the treatment brides described from salon owners or consultants even though I know full well that 1) there is another side to the story and 2) there is absolutely no proof that what they said was true. That my emotions would get involved shows I am human. It also illustrates the tremendous power of online reviews, which an overwhelming 85 percent of consumers say they trust as much as personal recommendations. Our story “One-Star Experiences” (pg. 86, July/August 2018) provides a snapshot into some of the most common complaints brides have about the dress shopping experience, as presented in online reviews. It was not intended as a reprimand but rather to give insight into the other side’s perspective. I know some of their complaints definitely surprised me, such as the fact brides don’t always feel comfortable changing in front of their consultants or engagement ring comments can be perceived as negative. These are good things to be aware of that may ultimately influence how you communicate with brides. Reviews are relatively rare. Only about 1.5 percent, or 15 people out of 1,000, actually write reviews, according to studies. This is such a small portion of the population that it’s important to keep everything in perspective. Online reviewers share certain traits. They are more likely to buy things in unusual sizes, make returns, be married, have more children, be younger, be less wealthy and have graduate degrees than the average consumer, according to a 2014 study published in the Journal of Marketing Research. They are also 50 percent more likely to shop sales and buy four times more products. Who you shop with – and why – is important. People out with their significant others tend to write the most positive reviews, followed by those out with friends or family. Reviewers who are alone or traveling for business tend to be the most negative, according to a study published last fall in Electronic Commerce Research and Applications. Emotion rules. People are much more likely to write reviews if they experience extreme emotions; this is why you see so many awesome and awful ones. Consumers prefer one and five-star reviews because their point is clear. However, for a fair evaluation of your business, pay particular attention to the three-star reviews, which tend to be more detailed and honest. Negative reviews are less common. For every one-star review, there are at least five positive reviews. As a result, the negative reviews really stand out. Negative reviews seem more credible. There is the perception – accurate or not – that some businesses reward shoppers to write positive reviews or even write them themselves. But obviously no one would encourage bad stuff to be said about their business. As a result negative reviews tend to be viewed as more credible. In fact, 95% of consumers suspect censorship or faked reviews when they don’t see bad scores and 68 percent trust reviews more when they see both good and bad scores, according to Reevoo Insight research published in 2013. Negative reviews improve conversion rates. It may sound counterintuitive but it’s true! Not only are diverse ratings trusted more than exclusively five-star reviews, but customers actually spend five times longer on a site if they interact with bad reviews, and convert 85 percent more often, according to Reevoo Insight research. Quantity trumps quality. Generally speaking people tend to choose products based more on the overall number of reviewers than a business’s average rating, according to a study published in Psychological Science. As such it’s crucial to encourage all customers to review your salon instead of just your happiest brides. Bad reviews humanize your business and make brides more likely to trust you. Of course, that’s not to say you want a bunch of them, or that they shouldn’t be addressed immediately and appropriately. However, it’s important to remember they aren’t cause for panic but rather a five-star opportunity to reflect, reorganize and rearrange!